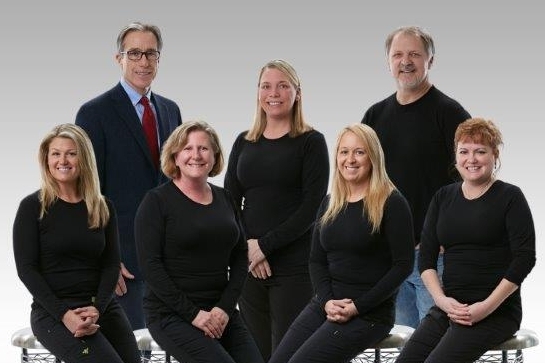 The staff here at Brian Fisher DDS and the Denture Care Clinic attend continuing education courses to stay current with procedures and materials to provide the best care possible. More importantly though, we consider ourselves a family who work together to identify and mindfully treat each patient as an individual with unique dental health needs. Dr. Fisher graduated from the University of Detroit Dental School in 1983 and has been treating patients in Northern Michigan ever since. He is a member of the American Dental Association, Michigan Dental Association and the Resort District Dental Society. Dr. Fisher is a 2nd generation dentist, having followed in his father’s footsteps and is delighted that his son will graduate from the University of Michigan's Dental School in 2017. Aside from dentistry, community involvement is important to Dr. Fisher. He is a long time board member and past president of Tart Trails, and supports many charitable organizations that serve our community. In his free time, Dr. Fisher enjoys the many outdoor activities that the Traverse City area has to offer with biking and paddling among his favorites. He and his wife Vera especially look forward to any opportunity to spend time with their grown children and three grandchildren. Kim is our office manager and has been with the practice for over 10 years. She loves greeting and working with the patients at the front desk and views every day as an adventure. Kim has been married to her husband Matt for ten years and the two of them enjoy long walks with their 12 year old dog Riley. She also loves golfing and staying active. Kelly has been working with Dr. Fisher for 18 years; initially as an assistant, then as a hygienist since 2002. She enjoys both the challenging and rewarding aspects of dentistry, and working to make our patients feel at ease in our office is her favorite part. Kelly has a son and two daughters who she loves spending her free time with and she thoroughly enjoys the outdoors whether it’s beaching and boating, skiing and snowshoeing, or hiking and camping. Trisha has been working as a hygienist for 25 years and has spent nearly all of it with Dr. Fisher. The staff here at Dr. Fisher’s office is like family. Trisha feels that because we truly care for one another, compassion spills over to our patients effortlessly! Trisha and her husband Kurt, have two active girls, Kelly and Kaitlyn. Along with Kaitlyn”s husband Jeff the family enjoys anything that involves being outdoors. Gardening, biking, swimming, jumping cliffs…you name it, they love it! Kathy is a Dental Assistant and has been a part of the staff at Dr. Fisher’s since 2003. She likes the challenges of dentistry and working for a denture focused practice. Kathy feels that every day presents a new experience, whether it be a new smile or helping a patient feel at ease. She enjoys the fact that together with her co-workers and Dr. Fisher we have formed a fun and compassionate team! Kathy’s two boys, ages 19 and 16 keep her happy and busy. They can be found at the beach, or kayaking, hiking and cooking. Melissa is a recent and welcome addition to our family here at Dr. Fisher’s office! She appreciates the overall caring and friendly atmosphere created by Dr. Fisher and the staff and is pleased to have joined our team! Melissa enjoys spending time with her children Paityn 10, and Blaine 8. Some of their favorite activities are camping, boating and wintertime tubing. They also love hanging out with their 3 year old Boston Terrier, Lola! Dale took the position as lab technician here over three years ago. He masterfully creates crowns, bridges and dentures right here in our office, making communication, timing, and overall interaction between Lab and doctor seamless. Dale, his wife Lucy, and son Zach all enjoy music and the great outdoors.